Kew, the area in which Kew Gardens are situated, consists mainly of the gardens themselves and a small surrounding community. Royal residences in the area which would later influence the layout and construction of the gardens began in 1299 when Edward I moved his court to a manor house in neighbouring Richmond (then called Sheen). That manor house was later abandoned; however, Henry VII built Sheen Palace in 1501, which, under the name Richmond Palace, became a permanent royal residence for Henry VII. Around the start of the 16th century courtiers attending Richmond Palace settled in Kew and built large houses. Early royal residences at Kew included Mary Tudor's house, which was in existence by 1522 when a driveway was built to connect it to the palace at Richmond. Around 1600, the land that would become the gardens was known as Kew Field, a large field strip farmed by one of the new private estates. The exotic garden at Kew Park, formed by Lord Capel John of Tewkesbury, was enlarged and extended by Augusta, Dowager Princess of Wales, the widow of Frederick, Prince of Wales. 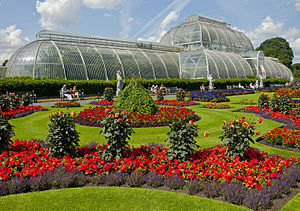 The origins of Kew Gardens can be traced to the merging of the royal estates of Richmond and Kew in 1772. William Chambers built several garden structures, including the lofty Chinese pagoda built in 1761 which still remains. George III enriched the gardens, aided by William Aiton and Sir Joseph Banks. The old Kew Park (by then renamed the White House), was demolished in 1802. The "Dutch House" adjoining was purchased by George III in 1781 as a nursery for the royal children. It is a plain brick structure now known as Kew Palace. The Palm House was built by architect Decimus Burton and iron-maker Richard Turner between 1844 and 1848, and was the first large-scale structural use of wrought iron. It is considered "the world's most important surviving Victorian glass and iron structure." The structure's panes of glass are all hand-blown. The Temperate House, which is twice as large as the Palm House, followed later in the 19th century. It is now the largest Victorian glasshouse in existence. Kew was the location of the successful effort in the 19th century to propagate rubber trees for cultivation outside South America. In February 1913, the Tea House was burned down by suffragettes Olive Wharry and Lilian Lenton during a series of arson attacks in London. Kew Gardens lost hundreds of trees in the Great Storm of 1987. From 1959 to 2007 Kew Gardens had the tallest flagpole in Britain. Made from a single Douglas-fir from Canada, it was given to mark both the centenary of the Canadian Province of British Columbia and the bicentenary of Kew Gardens. The flagpole was removed after damage by weather and woodpeckers made it a danger. The accompanying image shows a section of the walkway and the steel supports that were designed to rust to a tree-like appearance to help the walkway fit in with its surroundings. A short film detailing the construction of the walkway is available online. A panoramic view of the treetop walkway. It stands 18 metres (59 ft) above ground. The crossing won a special award from the Royal Institute of British Architects in 2008. A map of the gardens is available on the Kew Gardens website. Kew has one of the largest compost heaps in Europe, made from green and woody waste from the gardens and the manure from the stables of the Household Cavalry. The compost is mainly used in the gardens, but on occasion has been auctioned as part of a fundraising event for the gardens. The compost heap is in an area of the gardens not accessible to the public, but a viewing platform, made of wood which had been illegally traded but seized by Customs officers in HMRC, has been erected to allow visitors to observe the heap as it goes through its cycle. Free tours of the gardens are conducted daily by trained volunteers. In March 2006, the Davies Alpine House opened, the third version of an alpine house since 1887. Although only 16 metres (52 ft) long the apex of the roof arch extends to a height of 10 metres (33 ft) in order to allow the natural airflow of a building of this shape to aid in the all-important ventilation required for the type of plants to be housed. Kew's collection of Alpine plants (defined as those that grow above the tree line in their locale – ground level at the poles rising to over 2,000 metres (6,562 feet)), extends to over 7000. As the Alpine House can only house around 200 at a time the ones on show are regularly rotated. Originally designed for Buckingham Palace, this was moved to Kew in 1836 by King William IV. With an abundance of natural light, the building is used various exhibitions, weddings, and private events. It is also now used to exhibit the winners of the photography competition. The Orangery was designed by Sir William Chambers, and was completed in 1761. It measures 28 by 10 metres (92 by 33 ft). It was found to be too dark for its intended purpose of growing citrus plants and they were moved out in 1841. After many changes of use, it is currently used as a restaurant. The Palm House (1844–1848) was the result of cooperation between architect Decimus Burton and iron founder Richard Turner, and continues upon the glass house design principles developed by John Claudius Loudon and Joseph Paxton. A space frame of wrought iron arches, held together by horizontal tubular structures containing long prestressed cables, supports glass panes which were originally tinted green with copper oxide to reduce the significant heating effect. The 19m high central nave is surrounded by a walkway at 9m height, allowing visitors a closer look upon the palm tree crowns. In front of the Palm House on the east side are the Queen's Beasts, ten statues of animals bearing shields. They are Portland stone replicas of originals done by James Woodford and were placed here in 1958. Kew's third major conservatory, the Princess of Wales Conservatory, designed by architect Gordon Wilson, was opened in 1987 by Diana, Princess of Wales in commemoration of her predecessor Augusta's associations with Kew. In 1989 the conservatory received the Europa Nostra award for conservation. The conservatory houses ten computer-controlled micro-climatic zones, with the bulk of the greenhouse volume composed of Dry Tropics and Wet Tropics plants. Significant numbers of orchids, water lilies, cacti, lithops, carnivorous plants and bromeliads are housed in the various zones. The cactus collection also extends outside the conservatory where some hardier species can be found. The Temperate House, currently closed for restoration, is a greenhouse that has twice the floor area of the Palm House and is the world's largest surviving Victorian glass structure. When in use it contained plants and trees from all the temperate regions of the world. It was commissioned in 1859 and designed by architect Decimus Burton and ironfounder Richard Turner. Covering 4880 square metres, it rises to a height of 19 metres. Intended to accommodate Kew's expanding collection of hardy and temperate plants, it took 40 years to construct, during which time costs soared. The building was restored during 2014 - 15 by Donald Insall Associates, based on their conservation management plan. The ironwork for this project was provided by Richard Turner and the initial construction was completed in 1852. The heat for the house was initially obtained by running a flue from the nearby Palm House but it was later equipped with its own boiler. In the south-east corner of Kew Gardens stands the Great Pagoda (by Sir William Chambers), erected in 1762, from a design in imitation of the Chinese Ta. The lowest of the ten octagonal storeys is 15 m (49 ft) in diameter. From the base to the highest point is 50 m (164 ft). Each storey finishes with a projecting roof, after the Chinese manner, originally covered with ceramic tiles and adorned with large dragons; a story is still propagated that they were made of gold and were reputedly sold by George IV to settle his debts. In fact the dragons were made of wood painted gold, and simply rotted away with the ravages of time. The walls of the building are composed of brick. The staircase, 253 steps, is in the centre of the building. During the Second World War holes were cut in each floor to allow for drop-testing of model bombs. The Pagoda was closed to the public for many years, but was reopened for the summer months of 2006. It is now closed again but is intended to reopen under the aegis of Historic Royal Palaces in 2017. Following the Japan 2001 festival, Kew acquired a Japanese wooden house called a minka. It was originally erected in around 1900 in a suburb of Okazaki and is now located within the bamboo collection in the west central part of Kew Gardens. Japanese craftsmen reassembled the framework and British builders who had worked on the Globe Theatre added the mud wall panels. Within the conservation area is a cottage that was built sometime before 1771 for Queen Charlotte by her husband George III. It has been restored by Historic Royal Palaces and is separately administered by them. It is open to the public on weekends and bank holidays during the summer. The building underwent significant restoration, with leading conservation architects Donald Insall Associates, before being reopened to the public in 2006. It is administered separately from Kew Gardens, by Historic Royal Palaces. In front of the palace is a sundial, which was given to Kew Gardens in 1959 to commemorate a royal visit. It was sculpted by Martin Holden and is a replica of one by Thomas Tompion, a celebrated 17th-century clockmaker, which had been sited near the surviving palace building since 1832 to mark the site of James Bradley's observations leading to his discovery of the aberration of light. The Shirley Sherwood Gallery of Botanic Art opened in April 2008, and holds paintings from Kew's and Dr Shirley Sherwood's collections, many of which had never been displayed to the public before. It features paintings by artists such as Georg D. Ehret, the Bauer brothers, Pierre-Joseph Redouté and Walter Hood Fitch. The paintings and drawings are cycled on a six-monthly basis. The gallery is linked to the Marianne North Gallery (see below). Near the Palm House is a building known as "Museum No. 1" (even though it is the only museum on the site), which was designed by Decimus Burton and opened in 1857. Housing Kew's economic botany collections including tools, ornaments, clothing, food and medicines, its aim was to illustrate human dependence on plants. The building was refurbished in 1998. The upper two floors are now an education centre and the ground floor houses the "Plants+People" exhibition which highlights the variety of plants and the ways that people use them. Due to its historical holdings, Kew is a member of The London Museums of Health & Medicine group. The gallery had suffered considerable structural degradation since its creation and during a period from 2008 to 2009 major restoration and refurbishment took place, with works led by with leading conservation architects Donald Insall Associates. During the time the gallery was closed the opportunity was also taken to restore the paintings to their original condition. The gallery reopened in October 2009. The plant collections include the Aquatic Garden, which is near the Jodrell laboratory. The Aquatic Garden, which celebrated its centenary in 2009, provides conditions for aquatic and marginal plants. The large central pool holds a selection of summer-flowering water lilies and the corner pools contain plants such as reed mace, bulrushes, phragmites and smaller floating aquatic species. The world's smallest water-lily, Nymphaea thermarum, was saved from extinction when it was grown from seed at Kew, in 2009. The Kew Herbarium is one of the largest in the world with approximately 7 million specimens used primarily for taxonomic study. The herbarium is rich in types for all regions of the world, especially the tropics, and is currently growing with 30,000 new specimen additions annually through international collaborations. The Kew Herbarium is of global importance, attracting researchers from and supporting and engaging in the science of botany all over the world, especially the field of biodiversity. A large part of the herbarium has been digitised, referred to as the Kew Herbarium Catalogue, and is available to the general public on-line. Kew Gardens also holds other hebaria and collections of scientific importance such as a Fungarium - a herbarium for fungi -, a plant DNA bank and a seed bank. The Sustainable Uses of Plants group (formerly the Centre for Economic Botany), focus on the uses of plants in the United Kingdom and the world's arid and semi-arid zones. The Centre is also responsible for curation of the Economic Botany Collection, which contains more than 90,000 botanical raw materials and ethnographic artefacts, some of which are on display in the Plants + People exhibit in Museum No. 1. The Centre is now located in the Jodrell Laboratory. The original Jodrell laboratory, named after Mr T. J. Phillips Jodrell who funded it, was established in 1877 and consisted of four research rooms and an office. Originally research was conducted into plant physiology but this was gradually superseded by botanical research. In 1934 an artists' studio and photographic darkroom were added, highlighting the importance of botanical illustration. In 1965, following increasing overcrowding, a new building was constructed and research expanded into seed collection for plant conservation. The biochemistry section also expanded to facilitate research into secondary compounds that could be derived from plants for medicinal purposes. In 1994 the centre was expanded again, tripling in size, and a decade later it was further expanded by the addition of the Wolfson Wing. The gardens have their own police force, Kew Constabulary, which has been in operation since 1847. Formerly known as the Royal Botanic Gardens Constabulary, it is a small, specialised constabulary of two sergeants and 12 officers, who patrol the grounds in a marked silver car. The Kew Constables are attested under section 3 of the Parks Regulation Act 1872, which gives them the same powers as the Metropolitan Police within the land belonging to the gardens. A number of films, documentaries and short videos have been made about Kew Gardens. a 2004 episode of the BBC Four series Art of the Garden which looked at the building of the Great Palm House in the 1840s. "Kew on a Plate", a TV programme showing the kinds of produce grown at Kew Gardens and how they can be prepared in a kitchen. the 2014 video game Sherlock Holmes: Crimes & Punishments contains a chapter where Holmes investigates the theft of exotic plants and a murder at Kew Gardens. In 1921 Virginia Woolf published her short story "Kew Gardens", which gives brief descriptions of four groups of people as they pass by a flowerbed. Kew Gardens is accessible by a number of gates. Currently, there are four gates into Kew Gardens that are open to the public: the Elizabeth Gate, which is situated at the west end of Kew Green, and was originally called the Main Gate before being renamed in 2012 to commemorate the Diamond Jubilee of Elizabeth II; the Brentford Gate, which faces the River Thames; the Victoria Gate (named after Queen Victoria), situated in Kew Road, which is also the location of the Visitors' Centre; and the Lion Gate, also situated in Kew Road. Other gates that are not open to the public include Unicorn Gate, Cumberland Gate and Jodrell Gate (all in Kew Road) and Isleworth Gate (facing the Thames). Kew Gardens station, a London Underground and National Rail station opened in 1869 and served by both the District line and the London Overground services on the North London Line, is the nearest train station to the gardens – only 400 metres (1,300 ft) along Lichfield Road from the Victoria Gate entrance. Built by the London and South Western Railway, the Historic England listed building is one of the few remaining original 19th-century stations on the North London Line, and the only station on the London Underground with a pub on the platform (though the platform entrance is now closed off). Kew Bridge station, on the other side of the Thames, 800 metres from the Elizabeth Gate entrance via Kew Bridge, is served by South West Trains from Clapham Junction and Waterloo. London Buses route 65, between Ealing Broadway and Kingston, stops near the Lion Gate and Victoria Gate entrances; route 391, between Fulham and Richmond, stops near Kew Gardens station; while routes 237 and 267 stop at Kew Bridge station. London River Services operate from Westminster during the summer, stopping at Kew Pier, 500 metres (1,600 ft) from Elizabeth Gate. Cycle racks are located just inside the Victoria Gate, Elizabeth Gate and Brentford Gate entrances. There is a 300-space car park outside Brentford Gate, reached via Ferry Lane, as well as some free, though restricted, on-street parking on Kew Road. Dyduch, Amy (28 March 2014). "Dozens of jobs at risk as Kew Gardens faces £5m shortfall". Richmond Guardian. Retrieved 26 June 2014. "Royal Botanic Gardens, Kew". World Heritage. UNESCO. Retrieved 24 March 2009. "Kew, History & Heritage" (PDF). Royal Botanic Gardens, Kew. Archived from the original (PDF) on 29 August 2008. Retrieved 24 January 2013. "Director of Royal Botanic Gardens". Royal Botanic Gardens, Kew. 14 October 2010. Retrieved 24 April 2012. Malden, H E (1911). Kew, A History of the County of Surrey: Volume 3. pp. 482–487. Lysons, Daniel (1792). The Environs of London: volume 1: County of Surrey. pp. 202–211. "London Attractions and Places of Interest Index". milesfaster.co.uk. Harrison, W (1848). The Visitor's Hand-book to Richmond, Kew Gardens, and Hampton Court. Cradock and Company. p. 25. Parker, Lynn and Ross-Jones, Kiri (13 August 2013). The Story of Kew Gardens. Arcturus Publishing. p. 9. Jones, Martin. "Royal Botanic Gardens, Kew and Wakehurst Place". infobritain.co.uk. UNESCO Advisory Body (2003). UNESCO Advisory Body Evaluation Kew (United Kingdom) No 1084 (PDF) (Report). UNESCO. Drayton, Richard Harry (2000). Nature's Government: Science, Imperial Britain, and the 'Improvement' of the World. Yale University Press. p. 78. Smith, R G (1989). Stubbers: The Walled garden. Masson, Francis. 5 (1801–1820). Dictionary of Canadian Biography. 18 October 2007. Retrieved 24 April 2012. "Lancelot 'Capability' Brown (1716–1783)". Kew History & Heritage. Royal Botanic Gardens, Kew. Retrieved 16 March 2012. Lankester Botanical Garden (2010). "Biographies" (PDF). Lankesteriana. 10 (2/3): 183–206, page 186. Archived (PDF) from the original on 23 May 2014. "Palm House and Rose Garden". Visit Kew Gardens. Royal Botanic Gardens, Kew. Retrieved 11 June 2014. The Crystal Palace was an even more imposing glass and iron structure but fire destroyed it. "Suffragists burn a pavilion at Kew; Two Arrested and Held Without Bail – One Throws a Book at a Magistrate". The New York Times. 21 February 1913. Bone, Victoria (16 October 2007). "Kew: Razed, reborn and rejuvenated". BBC News. Retrieved 17 June 2014. "Kew Gardens Flagpole". Royal Botanic Gardens, Kew. Retrieved 24 January 2013. "Treetop Walkway". Royal Botanic Gardens, Kew. Retrieved 24 April 2012. "The making of the Treetop Walkway". Royal Botanic Gardens, Kew. Retrieved 24 April 2012. "Visit Kew Gardens: Visitor Information And Events To Inspire Your Visit". Royal Botanic Gardens, Kew. Retrieved 24 April 2012. "Compost heap". Royal Botanic Gardens, Kew. Retrieved 18 April 2015. "Compost heap". Visit Kew Gardens. Royal Botanic Gardens, Kew. Archived from the original on 3 February 2014. Retrieved 11 June 2014. "Visit Kew Gardens – The Orangery". Royal Botanic Gardens, Kew. Retrieved 24 April 2012. "Local Sculptures – 10 Queen's Beasts". Brentford Dock Residents. Retrieved 28 June 2014. Royal Botanic Gardens, Kew.Augusta, Princess of Wales. Retrieved 6 October 2005. "Temperate House, Royal Botanic Gardens". Donald Insall Associates. Retrieved 2 October 2015. "Waterlily House". Visit Kew Gardens. Royal Botanic Gardens, Kew. Retrieved 11 June 2014. Morley, James (1 August 2002). "''Kew, History & Heritage''". Kew. Retrieved 24 April 2012. "Dragons to return to The Great Pagoda at Kew after 200 year hunt". Historic Royal Palaces. Retrieved 29 July 2016. "'Japan 2001′ fest set to take center stage in U.K.". The Japan Times. 15 February 2001. Retrieved 26 January 2014. "Queen Charlotte's Cottage". Historic Royal Palaces. Retrieved 11 November 2015. "Kew Palace". Donald Insall Associates. Retrieved 2 October 2015. "Kew Gardens Sundial". Public Monuments and Sculpture Association. Retrieved 13 July 2014. "Medical Museums". medicalmuseums.org. Retrieved 26 August 2016. "Marianne North Gallery, Royal Botanic Gardens". Donald Insall Associates. Retrieved 2 October 2015. Ghosh, Pallab (18 May 2010). "Waterlily saved from extinction". BBC News. Retrieved 19 May 2010. Magdalena, Carlos (November 2009). "The world's tiniest waterlily doesn't grow in water!". Water Gardeners International. 4 (4). Retrieved 19 May 2010. "Kew website, Herbarium Collections". Royal Botanic Gardens, Kew. Retrieved 19 October 2016. "Welcome to the Kew Herbarium Catalogue". Royal Botanic Gardens, Kew. Retrieved 19 October 2016. "Jodrell Laboratory". Royal Botanic Gardens, Kew. Retrieved 17 June 2014. "Economic Botany Collection". Royal Botanic Gardens, Kew. Retrieved 17 June 2014. Jarvis, Alice-Azania (15 January 2014). "Kewdunnit! As a priceless lily is stolen from the botanical gardens, will thieves target your prize plants?". Daily Mail. McCarthy, Michael (30 January 2001). "How many policemen does it take to guard an orchid?". The Independent. "Parks Regulation Act 1872: 3 Definition of "park-keeper" Section 3". www.legislation.gov.uk. Retrieved 25 August 2014. "Parks Regulation Act 1872: 7 Powers, duties, and privileges of park-keeper". www.legislation.gov.uk. Retrieved 25 August 2014. "Videos". Royal Botanic Gardens, Kew. Retrieved 24 May 2015. "World Garden". British Council Film Collection. The British Council. Retrieved 24 January 2014. "A Year at Kew". Episode guide. BBC. 2007. Retrieved 26 January 2014. "BBC Two: Cruickshank on Kew: The Garden That Changed the World". BBC. 10 December 2011. Retrieved 24 April 2012. "Kew: Kingdom of Plants with David Attenborough". Kew.org. "IMDb: Time Team: Season 10, Episode 9 Kew Gardens, London". IMDb.com. "IMDb: Art of the Garden: Season 1, Episode 2 The Great Palm House at Kew". IMDb.com. Reid, Panthea (2 December 2013). "Virginia Woolf: early fiction". Encyclopaedia Britannica. p. 2. Retrieved 26 June 2014. Woolf, Virginia (1921). Kew Gardens. "Royalty opens Kew Gardens' Elizabeth Gate". Richmond and Twickenham Times. 21 October 2012. Retrieved 29 September 2014. "Which gate to use". Visit Kew Gardens. Royal Botanic Gardens, Kew. Retrieved 30 December 2014. "Getting here". Royal Botanic Gardens, Kew. Retrieved 24 May 2015. "Tap on the Line: History". Fuller's Brewery. Retrieved 24 May 2015. "Kew Gardens Station". Pastscape. Historic England. Retrieved 24 May 2015. "Route 65". London Bus Routes. Retrieved 19 July 2012. "Route 391". London Bus Routes. Retrieved 19 July 2012.